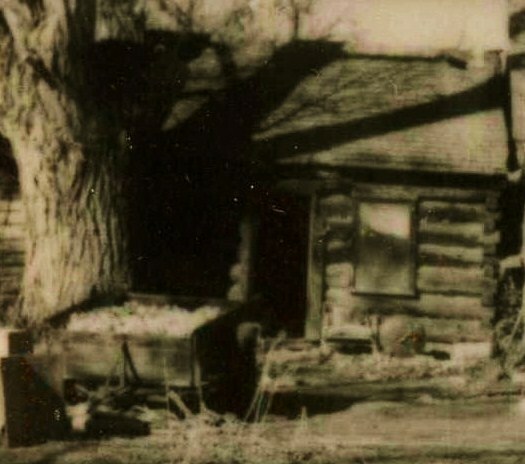 YESTERDAY: Randolf Brown house; photo circa 1930, Weber County Assessor. Native pioneer Randolph Brown (1864-1942), grandson of Capt. James Brown, built this hall-parlor house in 1900 when he was 36 years old. 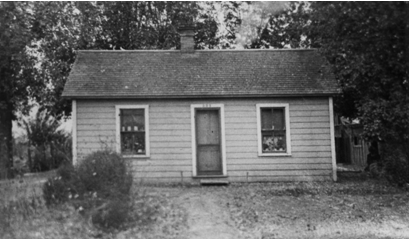 This house was located next to the Lynne Ditch and six blocks west of Five Points which was a busy business center with electric cars passing each way every few minutes in 1900. Randolf was a farmer and also worked for Ogden Pressed Brick and Tile Co. for 22 years. Next door to his house stood the old log cabin of his father, Sgt. Jesse Sowell Brown who died in 1905. At the turn of the century there were still many log cabins on 2nd Street amid the more modern houses built of adobe, board and brick that progressively appeared on the street. 2nd Street extended all way to 1200 West with active large farms on each side of the road. The Brown farm is now the Downs Street subdivision. Sketch of Randolf’s hall-parlor house plan; hall on the left, parlor on the right. Randolf Brown was born 20 May 1864 in Ogden a son of Jesse S. and Caroline Stewart Brown. He grew up on 2nd Street in a log cabin located at the intersection of Downs Drive and 2nd Street. His father and his Uncle Alex were Weber County’s first colonizers. Randolf was rendered deaf and dumb by the measles when he was twelve years old, and he communicated in sign language to his family and neighbors. He was 36 years old when he married Elsie Gesford and built this house between his father’s cabin to the east and the Lewis Taft cabin to the west. His new board, hall-parlor house must have looked quite modern in 1900 in contrast to these old cabins on either side of his house. Randolf and Elsie had five children. In May 1942 at age 78 Randolf was the victim of foul play. He was found in the Weber River near the West 33rd Street bridge suffering from effects of exposure, near drowning and trauma to the head. He died the next day. 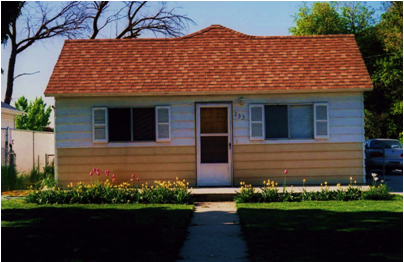 Randolf”s house remained in the Brown family for about 70 years. History of the Ogden 15th Ward, p.1. See http://www.orsonprattbrown.com/CJB/1829-1905-Jesse/jesse-sowell-br.html, July 5, 2011. Thomas Carter and Peter Goss, Utah’s Historic Architecture, 1847-1940, 1988, Utah State Historical Society, p. 14,15. Standard Examiner, Pioneer Dies After Mishap, May 1942.